God has created me to do Him some definite service; He has committed some work to me which He has not committed to another. I have my mission -- I may never know it in this life, but I shall be told it in the next. I am a link in a chain, a bond of connection between persons. He has not created me for naught. I shall do good. I shall do His work. I shall be an angel of peace, a preacher of truth in my own place while not intending it -- if I do but keep His Commandments. Therefore I trust him. Whatever, wherever I am, I can never be thrown away. If I am in sickness, my sickness may serve Him; In perplexity, my perplexity may serve Him; if I am in sorrow, my sorrow may serve Him. He does nothing in vain. He knows what He is about. He may take away my friends. He may throw me among strangers. He may make me feel desolate, make my spirit sink, hide my future from me -- still He knows what He is about. May He support us all the day long, till the shades lengthen, and the evening comes, and the busy world is hushed, and the fever of life is over, and our work is done! Then in His mercy may He give us a safe lodging, and a holy rest, and a peace at the last! 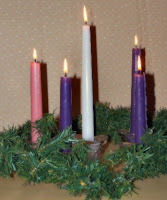 During these final days of Advent, each evening at Vespers we sing the beautiful "O" Antiphons. They are a group of ancient texts, each containing a title of our Messiah with a prayer that he come to save us. They begin on December 17 with "O Wisdom", and continue with "O Lord", "O Root of Jesse", "O Key of David", "O Rising Sun", "O King of the Nations", "O Emmanuel". The Latin text for these antiphons are: O Sapientia, O Adonai, O Radix, O Clavis, O Oriens, O Rex, O Emmanuel. The first letter of each one, beginning at the last, spells the Latin "ERO CRAS", which means, "Tomorrow I will be with you". On December 23rd the words are "O Emmanuel": God-With-Us. How comforting and encouraging to be reminded at this sometimes hectic season, that God is right there with us in all our joys and sorrows, all our hopes and fears. No matter how mundane or seemingly worldly, or simply practical the activity of the present moment might be, he is with us right in the midst of it. Just recalling this fact and being grateful for it, is a prayer. In this way, as we more and more often become momentarily aware of His presence, we begin to follow St. Paul’s recommendation to "pray always". Sister Mary Assumpta of the Precious Blood O.P. 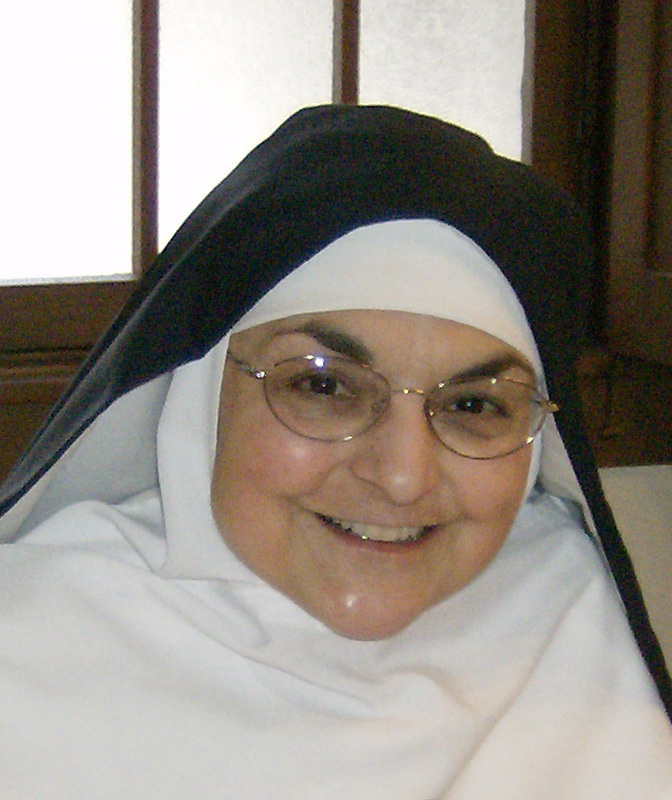 We ask the prayers of all our friends and followers for our dear Prioress, Sr. Mary Assumpta OP, whose leukemia has returned. She has taken all the chemo that was recommended and now the doctors say they can do nothing more for her. She is in good spirits and not afraid to die, and the Hospice nurses are helping us take good care of her, as she lives her last few weeks in peace and abandonment to the loving wisdom of God. But we are still praying for a miraculous cure through the intercession of Mother Mary Alphonsa OP (Rose Hawthorne) if it be for the glory of God and the good of her soul. Mother Alphonsa, the daughter of the famous author, Nathanael Hawthorne, was the foundress of the congregation of Dominican Sisters who are dedicated to the care of incurable cancer patients. Please join us in prayer. and with no one to care for them. she strove to see in them the face of your Son. In her eyes, those in need were always "Christ’s Poor." will inspire us to be generous in our service of neighbor. according to the designs of your holy will. Most Sacred Heart of Jesus have mercy on us! (3 times). How blessed we are to be celebrating the glorious Solemnity of the Immaculate Conception! Mary, "full of grace" and " the highly favored one," was immaculately conceived in the womb of St. Anne, free from original sin from the moment of her conception, and each year we are reminded of this singular grace bestowed upon her. Because of this, Mary did not suffer the consequences of the first sin of Adam and Eve. She was free from any inclination to sin. It is only fitting that the mother of Our Lord and Savor be preserved from original sin. She is the glorious, radiant and pure vessel in whose womb Jesus was conceived through the power of the Holy Spirit. We all turn to Mary Immaculate because she is the holy and perfect one. She is our Mother and intercessor before the throne of God. She enjoys the privilege of being in heaven body and soul. At the foot of the cross Mary was given to us when Jesus utter the words, "Woman, behold thy son." John, the beloved disciple, represents all of us. The bond between mother and child is unlike any other earthly bond.As we go to our mother in time of need, we look to Mary, placing our trust in her. So many saints, when their earthy mother was taken from them took Mary to be their mother. We do not have to wait for that moment. Let us take Mary as our confidant and guide now by consecrating ourselves to her Immaculate Heart. Mary points the way to Jesus. St. Louis de Montfort said, "The surest and quickest way to Jesus is through Mary." As we wait for the coming of our Savior, may Mary smile tenderly upon us bestowing her maternal blessing that we may open our hearts to receive all the blessings of this Advent season. Part of our traditional decorations at this time of year is the beautiful Advent wreath. This lovely ornamentation has much symbolism and is worthy of contemplation. The fact that we arrange our candles in a circle rather than a square is significant because, having no beginning and no end, it suggests the eternity of God and the immortality of the soul. The evergreens used as a base again signify undying life, and each type has its own meaning: laurel leaves stand for victory over persecution and suffering; pine, holly, and yew symbolyze immortality; and cedar branches mean strength and healing. Holly also has a special Christian symbolism: The prickly leaves remind us of the crown of thorns, and one English legend tells of how the cross was made of wood from the holly tree. Any pine cones, nuts, or seedpods used to decorate the wreath also symbolize life and resurrection which was won for us through Jesus who comes into the world at this season. The candles used are usually four in number, and according to one legend, signify the 4000 years after Adam and Eve during which the world waited for the birth of our Redeemer. 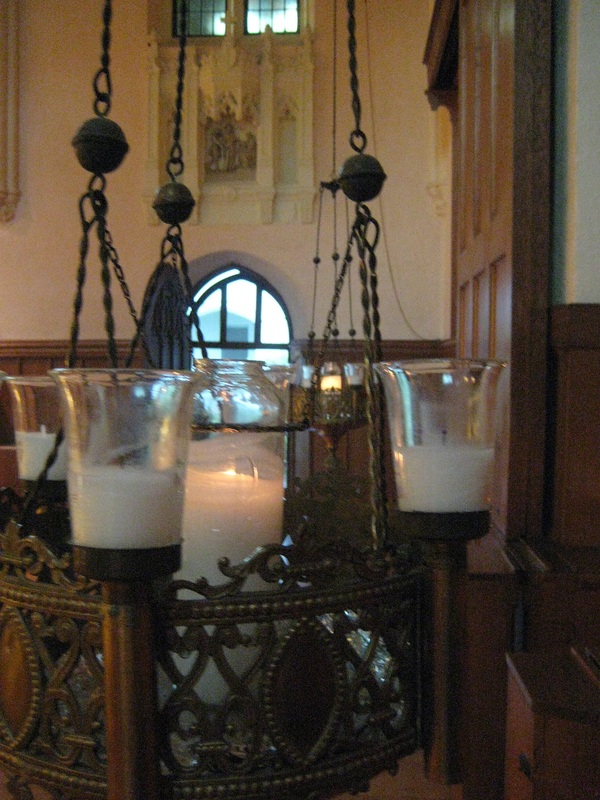 In some families a fifth candle is added in the center which is always white and signifies Christ Himself. This candle is not lighted until the day of His coming, Christmas day. The color of the candles is also important. We use purple which is the color of prayer, penance and sacrifice with which we prepare for the coming of Christ. But why should we use purple in this season of joy? Because we rejoice that we have been given the gift of repentance. Each of us can look within and see that we have fallen short of what we could be in the life of grace. But now is when we have been given the time to turn back to our loving God and ask for the forgiveness which He so eagerly offers us. The one rose candle is used on the week of Gaudete Sunday and reminds us again of the joy of repenting and accepting this grace. The flame of the candle is a light in the darkness of winter and the darkness of our life. Hopefully it is not a sputtering wick or a weak glow as if from a pocket flashlight, but a bright jumping flame that speaks of life and enthusiastic joyfulness. Our candles begin as tall, stately tapers, and one by one they begin to burn down. Slowly, each night as we light them again, they are consumed, drip by drip. They can’t go back and burn tomorrow what was already depleted last night. This is a wonderful reminder to us that our life, too, is made up of passing years, days, moments. From the day we came into this world we began to spend, consume, our number of days, and our life on this earth is getting shorter, just as is the candle. Whether we are 20, or 40 or 80 years old, each day is precious and irretrievable. It helps us to use each day to the best of our ability and not put off until tomorrow what should be done today, especially in our journey toward God. and a thousand years are as one day. The Lord does not delay in keeping his promise -- though some consider it "delay." since he wants none to perish but all to come to repentance.